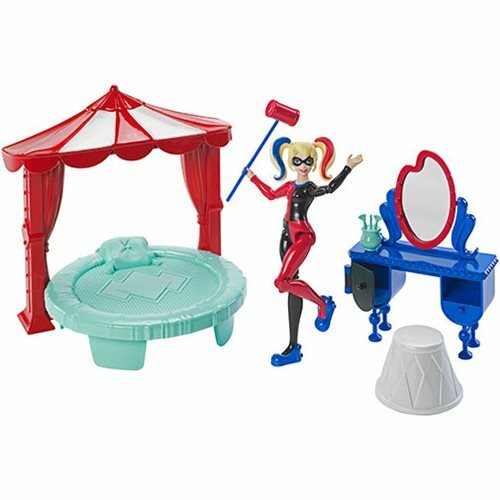 Shopping for Harley Quinn Playsets? Get ready for play with this DC Super Hero Girls Harley Quinn Bedroom Playset! This playset includes a signature style bed with headboard frame, a desk with cool transforming features, a chair, and smaller accessories that highlight the characters powers and personality. Harley Quinn's bed will make you giggle shaped like a trampoline with a circus-themed headboard. Her desk becomes a vanity when you flip the mirror, and smaller pieces, like a vanity brush set and her giant mallet, add to the storytelling fun. This playset also includes a 6-inch Harley Quinn figure ready for action-packed dreams wearing signature pajamas. Recreate scenes from the series or make up your own stories and unleash your inner hero along with this DC Super Hero Girls Harley Quinn Bedroom Playset!